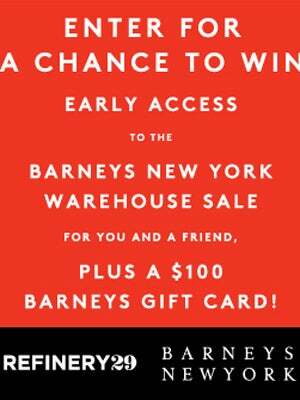 Barneys Warehouse Sale. See? Just mentioning it can set our hearts aflutter. Like the Aurora Borealis or an Anna Wintour smile, the seasonal event is a rare treat worthy of our utmost attention and immediate perusal. In fact, nothing is a more cherished post-Valentine's Day tradition; Who needs romance when you have luxury at majorly reduced prices? We could sit and mention all the brands shoppers can score at a ridic 75% off, but we'd be here all day — prohibiting us from scanning the eye-catching selection of men's, women's, accessories, and home must-haves. There's a reason a city stops for a Barneys Warehouse sale: How else can we make it to the summer? To give some lucky readers a head start on the sale, Barneys is giving out 10 exclusive passes to R29 readers — five in New York, and five in Los Angeles. Winners will receive first dibs on killer goods by stopping in a day early, and will receive a $100 gift card. Oh, and because shopping alone is never fun, each VIP will get to bring a pal along, as well. To be the envy of all your friends, enter here to win! When: Saturday, February 11, 9 a.m. to 7 p.m.; Sunday, February 12, 10 a.m. to 7 p.m.; Monday, February 13 to Friday, February 17, 10 a.m. to 8 p.m.; Saturday, February 18 to Monday, February 20, 10 a.m. to 7 p.m.
Where: Los Angeles Convention Center, South Hall/Area K, 1201 South Figueroa Street; 310-777-5700. When: Thursday, February 16 and Friday February 17, 8 a.m. to 9 p.m.; Saturday, February 18 and Sunday, February 19, 10 a.m. to 8 p.m.; Monday, February 20, 9 a.m. to 9 p.m.; Tuesday, February 21 to Thursday, February 23, 10 a.m. to 9 p.m.; Friday, February 24, 9 a.m. to 9 p.m.; Saturday, February 25 and Sunday, February 26, 9 a.m. to 8 p.m.
Where: 255 West 17th Street (between 7th and 8th avenues); 212-450-8400.